A member of the Disney Vacation Club, Disney’s Hilton Head Island Resort makes its home on Longview Island. 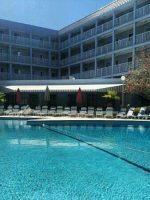 Surrounded on two sides by the waters and marshes of Broad Creek, the heart of the resort is here, where the various lodging and amenities are interspersed with sweeping live oak, pine and palmetto trees. The combination results in an intimate village reminiscent of an old-fashioned summer camp, one where the kids range in age from newborn to teens. And with a menu of activities and amenities that cater to all interests, the resort makes all guests feel like it was created just for them. While Mickey and Minnie are not out strolling the grounds, you will find subtle Disney touches throughout the resort and in the accommodations. Keep your eyes open to see what you can find! 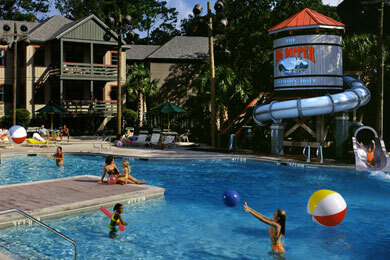 Guests of Disney's Hilton Head Island Resort will love the spacious accommodations available. Deluxe Studios are the smallest rooms at 375 square feet, however, they still have the ability to sleep up to four adults plus one child age 3 or younger (in the provided Pack 'N Play). Studios feature a queen bed and double sleeper sofa along with a small refrigerator, microwave, coffee maker, and private porch or balcony. At 800 square feet, the One-Bedroom Villa can accommodate up to four adults plus one child age 3 or younger (in the provided Pack 'N Play), and features a master suite with king bed, living room with queen-size sleeper sofa, full kitchen, washer and dryer, and private porch or balcony. The Two-Bedroom Villa measures 1,255 square feet and features a master suite with king bed, a second bedroom with two queen beds and a queen-size sleeper sofa in the living room, thereby accommodating up to eight adults plus one child age 3 or younger (in the provided Pack 'N Play). The two bedroom also has a full kitchen, washer and dryer, and private porch or balcony. For large parties, the three-bedroom Grand Villa will sleep up to 12 adults plus one child age 3 or younger (in the provided Pack 'N Play). At 2,125 square feet, the Grand Villa is divided into two floors. The first floor includes the master suite with king bed, full kitchen, washer and dryer, dining room, living room with queen-size sleeper sofa, and a private porch. The second floor includes two bedrooms, each with two queen beds and a private bath. Standard amenities found in all guestrooms include an alarm clock with radio, televisions and DVD player, and coffee makers. Accommodations with full kitchens include the basics for cooking and eating, however, if you plan to cook a lot, you may want to bring some of your own cooking essentials with you. Cleaning services such as washing dishes are provided for an additional fee. Check with the resort staff for exact pricing on the services you desire. It was a great vacation for our family. We love the fun in this hotel. They have lots of activities. You will feel the joy of every people in the hotel. Unlike any hotel in the island. All they have to do is make the guests drunk so they can get lots of money to them. This is the best and fun place that i’ve been in Hilton head island. It is also near the shelter cove marina where me and my wife can hang out there and leave our children to the hotel. I will recommend this for everybody. I love the place very cute and very clean place. I love disney since when I was young. I feel like in a wonderland. Not for kids but for adults only. Their food in the restaurants was very delicious. This is the best Hotel in the Hilton head island. When visiting Disney's Hilton Head Island Resort, guests naturally want to experience the water, whether in the pool or at the beach. 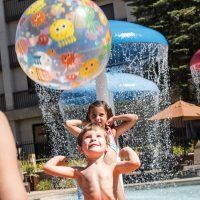 In the heart of the resort, the Big Dipper heated pool and spa offers great fun with a wraparound water tower slide, while beginner swimmers can dodge water-spitting frogs at the Little Dipper pool. If it's a view of the ocean you want, sans sand, head to Disney's Beach House pool, located about one mile from the main resort property overlooking the Atlantic Ocean. Water volleyball equipment is available upon request. Of course, those wanting the total beach experience can get their fill at the beach outside Disney's Beach House. 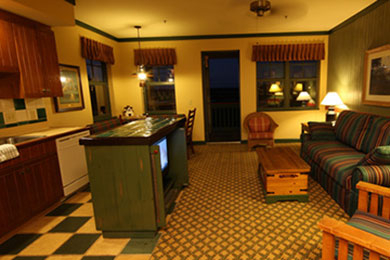 It's important to note that Disney's Beach House is located one mile from the main resort and accommodations. Therefore, unless you want to spend your time trekking back and forth, be sure to pack everything you want and need for a day at the beach before heading out. Beach chairs and umbrellas are available for a fee. Complimentary shuttle service is available between the main resort and Disney's Beach House. A great way to explore the resort and surrounding area is by bicycle. Bikes are available for rent at Disney's Hilton Head Island Resort, and bikers can explore all paths throughout the resort. These are flat, easy-to-navigate paths ideal for bikers of all ages and skill levels. Outside the resort, resort guests can bike through Palmetto Dunes, which is across Highway 278 from Disney's Hilton Head Island Resort. There is an underpass that allows safe passage between the two; make sure to bring your resort identification with you. Also, bikers can travel the public path that runs parallel to Highway 278 from School Road to Sea Pines Circle, along Pope Avenue and North and South Forest Beach Drives. Check with Disney's Hilton Head Resort staff for a map detailing these bike paths. Throughout Disney's Hilton Head Island Resort, guests will find a number of fun things to do. For instance, near the pool house in the main property, there's shuffleboard and a beanbag toss game. Next to building 24, you'll find a playground for kids ages 5 to 12, and there are horseshoe pits by buildings 18 and 19 and behind the Live Oak Lodge. Across from building 16, there's a basketball court. There's a foosball table at the main pool house, a pool table in Big Murggie's Den at Live Oak Lodge, and the Big Buoy Arcade at The Surfmen's Station at Disney's Beach House. Or you can skip it all, and spend a few hours lounging in the hammocks scattered throughout the resort grounds. Disney's Hilton Head Island Resort also offers a number of ways to enjoy the beautiful surroundings. For instance, guests can try to land the big one off the 300-foot fishing pier with gazebo that stretches from the back of the resort into Broad Creek. Also, throughout each day, guests can "Meet the Naturalist" to learn more about sea critters such as logger-head sea turtles or take a nature walk around the resort. (Please note that some of these programs require an additional fee to participate.) In addition, the resort's recreation staff assists guests in booking off-site excursions like dolphin tours, kayaking adventures and shark fishing. Daily, the recreation staff of Disney's Hilton Head Island Resort holds a number of fun activities for families and kids of every age; activities range from arts and crafts projects (additional fees may apply) and story times to pool games and scavenger hunts, plus so much more. Guests can pick up a complete list of weekly activities at the Live Oak Lodge or the recreation sign-up office. Each day, the recreation staff also puts out a new challenge booklet for children at the recreation sign-up office. Activities within the booklet include a scavenger hunt, brainteasers and games. In the evenings, kids ages 5 to 12 can take part in Disney's Kids Night Out. These special three-hour outings range from a night of challenging activities to movies and pizza night. Lest your teenagers feel left out, the resort also hosts Teen's Night Out with movies and pizza night. Additional teen activities include teen mini golf, teen Capture the Flag, teen billiards and iTeen Hoops. For full details and the most current schedule, check with resort staff during your stay. Disney's Hilton Head Island Resort boasts several dining options, albeit for breakfast and lunch only. Near the Big Dipper pool adjacent to the Broad Creek Mercantile, guests can grab a bagel or biscuit for breakfast or have a tuna wrap or chicken Caesar salad for lunch at Tide Me Over. This eatery also features a kids' menu with items such as burgers, hot dogs, grilled cheese and chicken fingers. At Disney's Beach House, Signals offers up burgers, wraps and salads along with a selection of sides and beverages. Also, small bites and refreshments can be found at Surfman's Sand Bar. Please note that both dining spots at Disney's Beach House operate on a seasonal schedule, so check with resort staff to see if they will be open during your stay. Another on-resort option for meals is cooking in your villa. With the exception of studio rooms, all accommodations are outfitted with fully equipped kitchens, so cooking-in couldn't be easier. Want to grill? No problem. Grills are located throughout the resort, with picnic tables conveniently nearby. Or take your grilled meal back to your own villa, and enjoy it al fresco on your private deck, complete with picnic table. Complimentary Wi-Fi can be found throughout the resort. Self-parking is available at no cost. Guests can find sundries, souvenirs, limited groceries and DVD rentals at this general store. Charcoal barbecue grills can be found throughout the resort. As with many beach destinations, Disney's Hilton Head Island Resort is very busy throughout the summer, which means peak rates. For the fewest crowds, plan a visit during the winter (except for Thanksgiving, Christmas and New Year's). For the best bargain, book your trip for February (excluding winter break dates -- check with resort for specific dates). Because Disney's Hilton Head Island Resort is in South Carolina's low country, it's most pleasant to visit during spring or fall when the humidity is low. Disney's Hilton Head Island Resort is 45 miles north of Savannah, Ga., and 100 miles south of Charleston, S.C., approximately 25 miles from Interstate 95 via Highway 278. When traveling by air, visitors can land just minutes from the resort at Hilton Head Island Airport. Just 45 minutes away, Savannah/Hilton Head International Airport is served by multiple airlines. Although the resort does not provide shuttle service to any airport, resort staff can assist in arranging transportation for guests. A complimentary shuttle service, which runs every half hour, is available between the main resort and Disney's Beach House and bicycling through the resort is the most scenic option. When the kids are off playing and the parents have some quiet time together, consider cuddling up in a hammock or going for a quiet stroll along the marina. For an intimate dinner for two, head to one of the more upscale dining establishments located nearby.